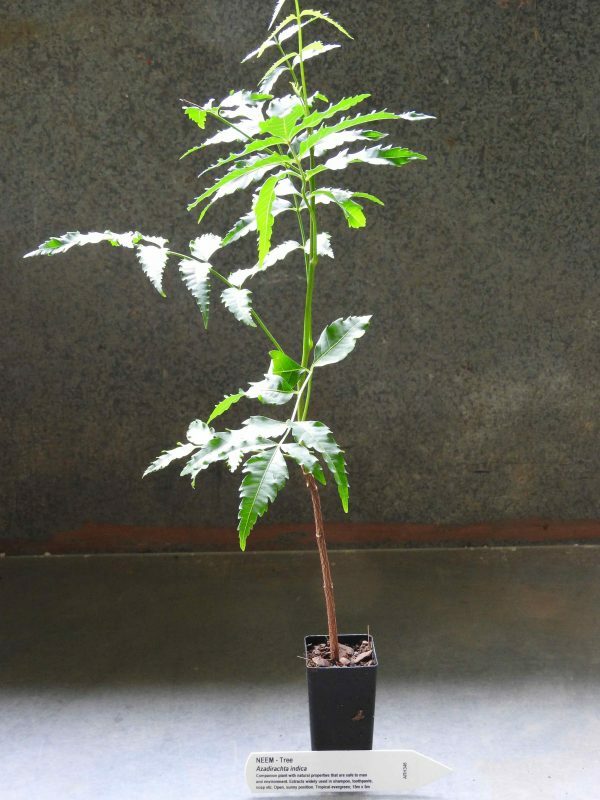 Neem Tree, Azadirachta indica, is a companion plant with natural insecticide properties that are safe to man and environment. Twigs are used as tooth brushes that release anti-bacterial compounds. Bark is used to treat fever, nausea and skin diseases. Leaves utilised as a poultice to treat wounds. Extracts widely used in shampoo, toothpaste, soap etc. Neem Tree is a native of Asia. Prefers light to medium soils in an open, sunny position. Drought and frost resistant. A tropical evergreen tree growing to 15m x 5m. Produces clusters of small fragrant creamy-white flowers, followed by yellow to reddish fruits which contain its seeds.